North of Aberdeen, the road follows to coast picking its way through a number of Villages: Balmedie, Tipperty, Ellon, Cruden Bay & Peterhead. This is land of coastal dunes before the land rises into the hills and Highlands. If you follow the A90 north from Aberdeen, you can travel a coastal trail that most visitors seem to ignore. 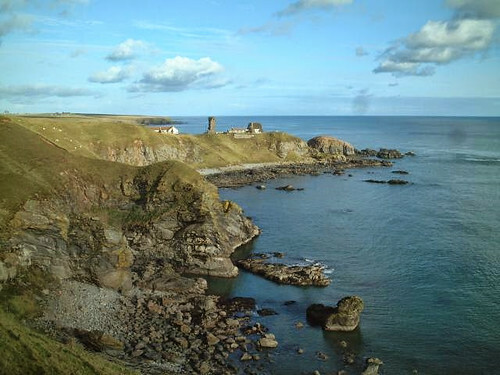 North of Menie House take the A975 to follow the coast past Newburgh, Foveran over the River Ythan to Cruden Bay. You can stop to flick the finger at Trumps golf course if your politics leads you that way. Balmedie Beach has a lovely sandy beach although it can be a cold wind that blows in off the North Sea. If it is lovely sunny day, its a wonderful walk along with the country park behind. There is another lovely beach at Newburgh which is famous for sights of sleeping seals in the estuary.